The Laws of Manu form a towering work of Hindu philosophy. 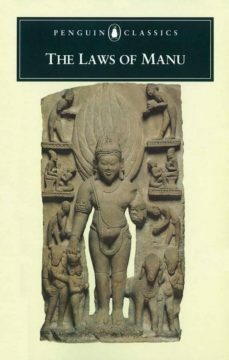 Composed by many Brahmin priests, this is an extraordinary, encyclopaedic representation of human life in the world, and how it should be lived. Manu encompasses topics as wide-ranging as the social obligations and duties of the various castes, the proper way for a righteous king to rule and to punish transgressors, relations between men and women, birth, death, taxes, karma, rebirth and ritual practices. First translated into English in 1794, its influence spread from Nietzsche to the British Raj, and although often misinterpreted, it remains an essential work for understanding India today.